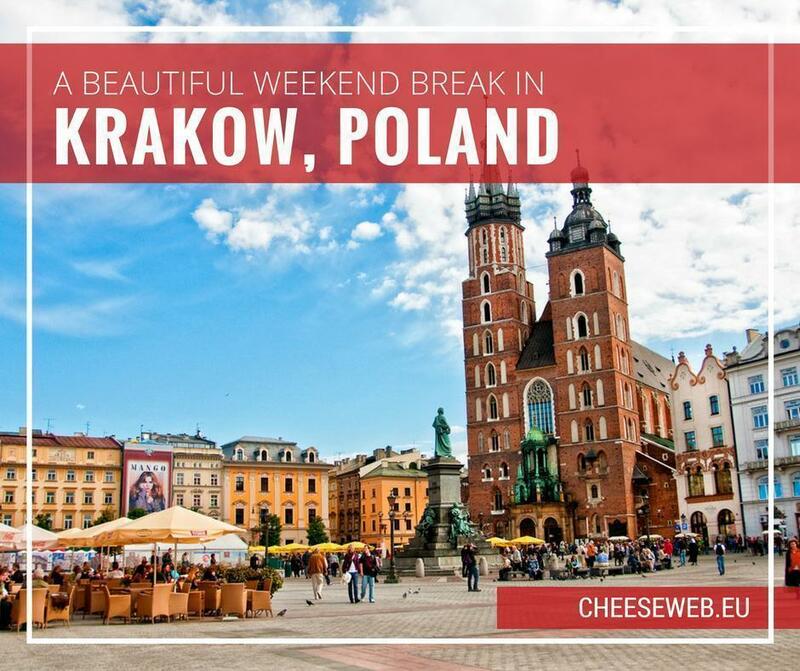 We share the best things to do in Krakow Poland on a weekend trip, including the top Krakow tourist attractions, where to stay in Krakow and tasty restaurants to try in the historic centre. Clip-clopping along cobbled streets, lined with Easter-egg coloured buildings, snuggled in a horse-drawn carriage next to my husband, was not how I pictured my weekend in Krakow, Poland. But then again, many things about this beautiful little city surprised me – mostly, why I had never considered visiting Krakow before. 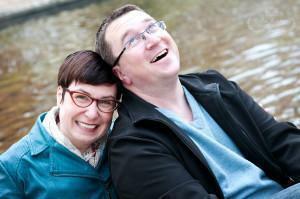 When Andrew and I were first invited to our friends’ wedding in Poland, we jumped at the chance. Not only could we celebrate the marriage of a lovely international couple (Polish and Belgian) but we could also check another country off our list. We’ve both been itching to venture into Eastern Europe, and now we had a chance to visit with expert advice from a local. With the wedding celebrations planned for Saturday, we decided to make the most of our trip and spend some time doing some Krakow sightseeing. We arrived Wednesday afternoon and settled in for three days of hitting all of the Krakow points of interest. The Globetroter Guesthouse is a great place to stay in Krakow’s city center. 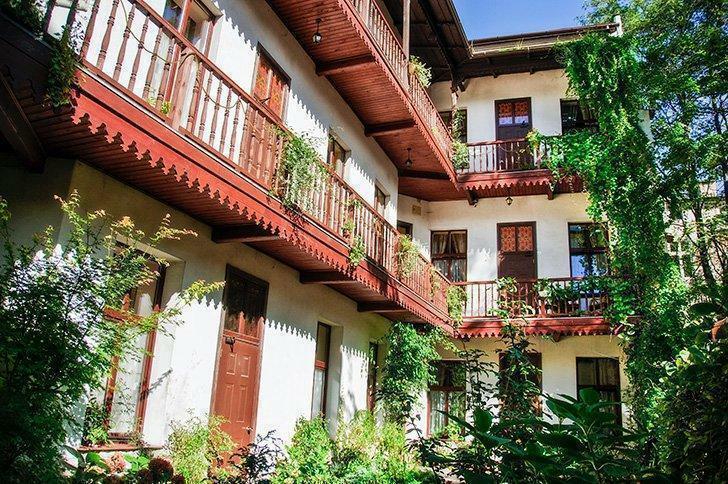 Our accommodations in Krakow were at the lovely and very well situated Globetroter Guesthouse. The rooms were a good size with nice bathrooms (always a plus). The staff was incredibly helpful and friendly, and the price was very reasonable given the location. Best of all, we were within stumbling distance of Krakow’s historic market square. 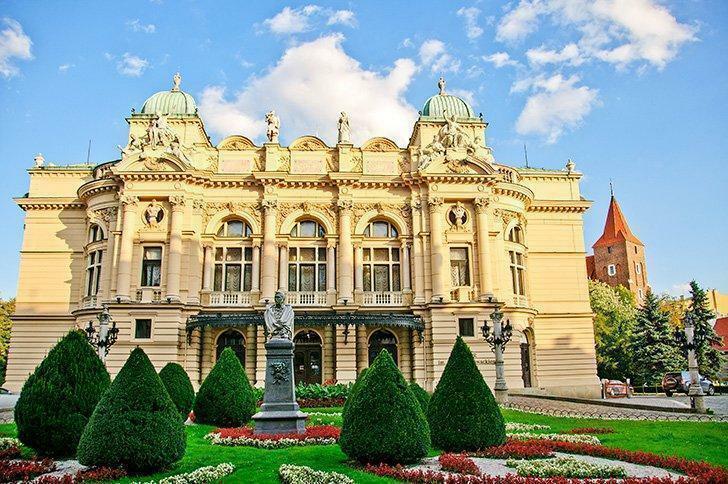 For more suggestions for the best hotels in Krakow Poland, check out our favourite booking site, Booking.com. 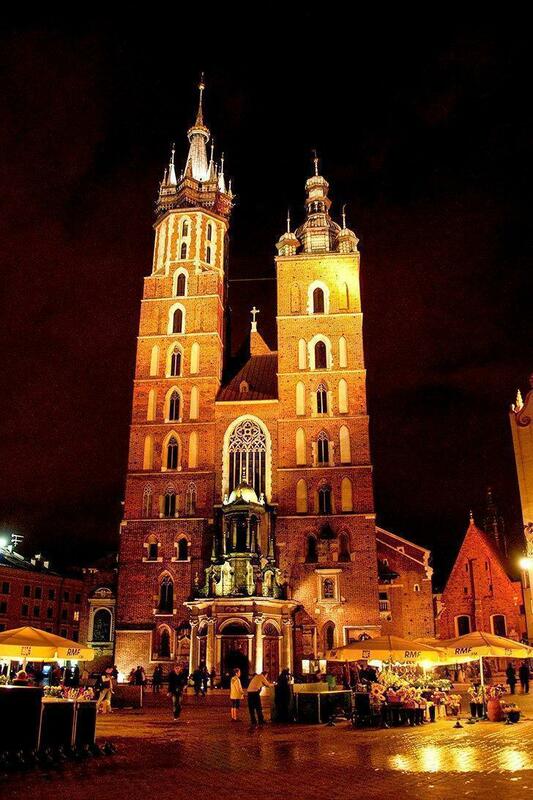 Krakow is located in the middle of southern Poland. It is 286km south and slightly west of Warsaw and 272km southwest of Wroclaw. It is close to the borders of Czech Republic and Slovakia to the south and it is 326km east of Lviv, Ukraine. The beautiful green city centre of Krakow, Poland. Krakow (or Cracow in English) is the second largest city in Poland, and its historic centre was declared a UNESCO World Heritage Site in 1978. The centre is circled by a greenbelt, called Planty Park, where the former city walls stood. This lovely park was filled with people walking dogs, pushing strollers and enjoying the last of the lovely autumn weather, the entire time we were there. The charming historic center is a must-see tourist attraction in Krakow, Poland. 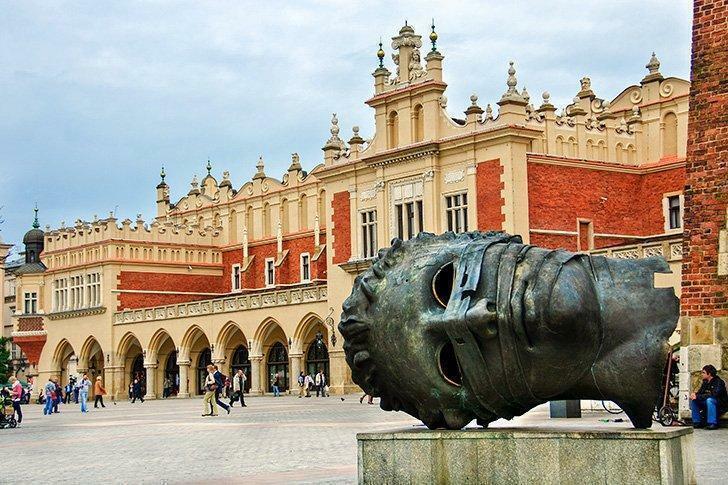 There are loads of museums and other places to visit in Krakow, Poland. If you plan to spend a lot of time sightseeing, it’s worth considering the Krakow Tourist Card. This is a two or three-day city pass that gives you admission to 40 museums and attractions including Oscar Schindler’s Factory, St. Mary’s Basilica, and even vampires under the market square. The Tourist Card also gives you free transportation on the city’s buses and trams so you can ride all you like. I’ll be the first to admit, my knowledge of all things Eastern European is pretty limited, although I’m fortunate to have a couple of friends from the region. I had no idea what to expect from Poland in general and Krakow specifically. When we first strolled into the main square, I was pleasantly surprised. The square is dominated by the Sukiennice, the former Cloth Hall or Draper’s Hall. During the Renaissance, Krakow was Poland’s capital and traders came from around the country to sell their wares in this stunning building. Now it’s a Mecca for tourists looking to buy affordable amber jewellery and other souvenirs. Krakow’s Town Hall Tower dominated the Market Square. The market square, or Rynek Główny in Polish, is also home to the stunning St. Mary’s Basilica on one end and the town hall tower on the other. The rest of the square is surrounded by colourful cafes and shop fronts which seem to be bustling at all hours of the day. St. Mary’s Basilica is beautiful at night. Instead, we enjoyed the sun and a drink while sitting at a cafe (something we always try to do at least once when we visit a new city). As we sat and watched the horse-drawn carriages come and go, we thought it would be a nice way to round out the evening. That’s how I found myself in a bright red carriage, holding up traffic and not caring a bit, as we trotted through town. Touristy – definitely. A lovely way to wrap up a day in Krakow – absolutely. St. Peter and St. Paul’s Church is a great place to catch a classical concert. If you spend any time walking past churches in Krakow, and it’s hard not to, you can’t help but notice signs for chamber music concerts. We decided to take in a Chopin and Mozart concert in St. Peter and St. Paul’s Church, put on by the Krakow Chamber Orchestra of St. Maurice. The concert was lovely, and we thought it was a great way to bring people and money into the many beautiful churches in old Krakow. You can leave it to chance as we did and try to purchase tickets while you’re there or you can book a Chopin Piano Recital at the Chopin Gallery. 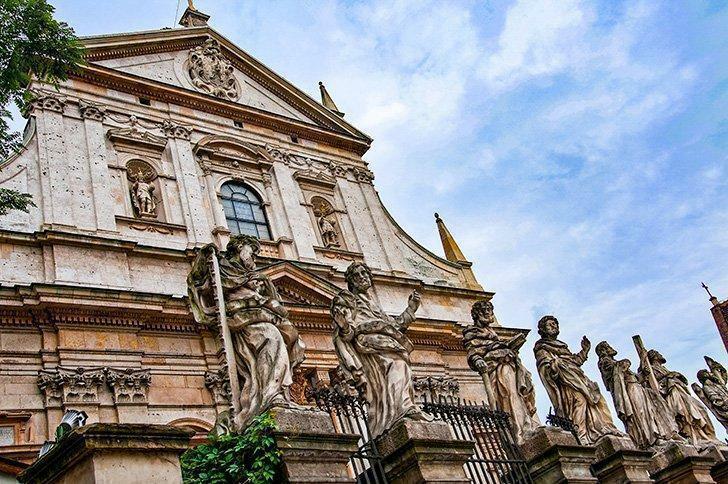 For a truly divine experience, you can book a full-day tour combining spiritual Catholic and historical heritage places culminating in a 3-course Polish meal and a classical music concert! We opted to get up early and spend a day at one of Krakow’s most famous sights, The Wawel. The Wawel is a castle complex overlooking the Vistula River in Krakow’s historic centre. It contains the Royal Castle, armoury, treasury and a cathedral. 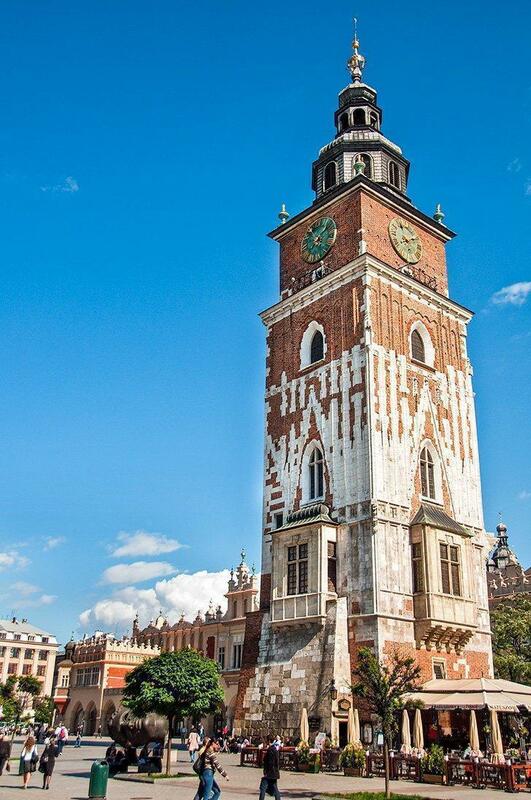 Many of the guided tours of Krakow include the Wawel, but not all do, so be sure to check the details when you book. 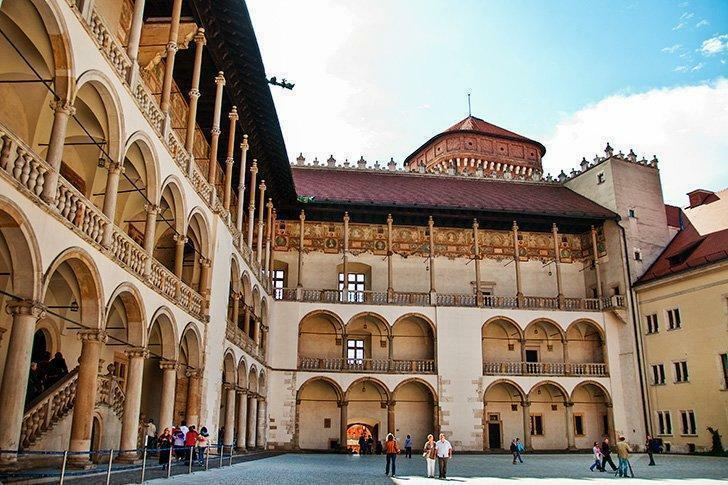 You can also book a tour just of the Wawel castle itself and the tour price will include your admission tickets. The ticketing system for the Wawel is a bit complex, as there are different tickets for each building and no combination tickets are available. Tickets for areas like the Royal Apartments are limited, so it’s best to arrive early. Andrew and I decided to see the armoury, treasury, archaeology exhibit and the dragon’s den. I also wanted to have a peek inside the cathedral, which is free unless you want to see the museum section. If so, it is possible to buy tickets to the Royal Cathedral online. We visited the treasury and armoury first. Andrew enjoyed looking at all of the various weapons, but I was a bit let down by the Treasury side of things. While I was hoping for jewellery, what I got was fancier weapons. It wasn’t my thing. The archaeology exhibit, however, was fascinating. As happened in many cities in Europe, one building was built on the remains of an earlier one. Currently, they are painstakingly uncovering pieces of the old Wawel, and you can wander through some of these remains, in this exhibit. Although we didn’t go inside the apartments, the architecture of the Royal Castle was lovely. The cathedral was also magnificent and filled with ornately carved tombs of Krakow’s royalty. Our final stop was the intriguingly titled Dragon’s Den. 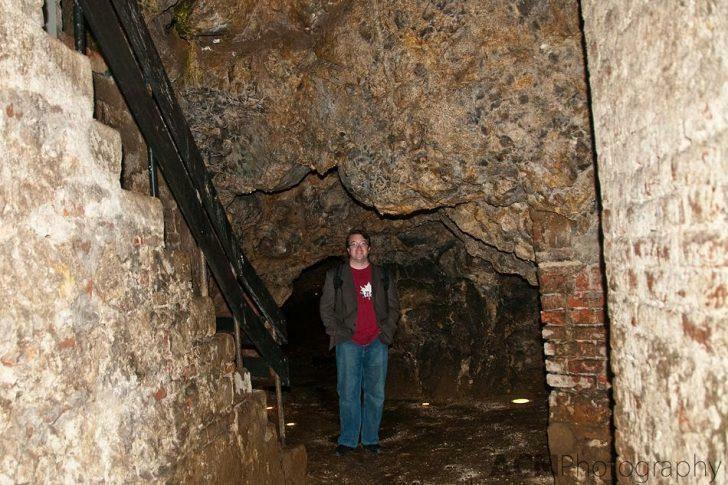 It is a series of caves under the Wawel, where a dragon of Polish legends is said to have lived. 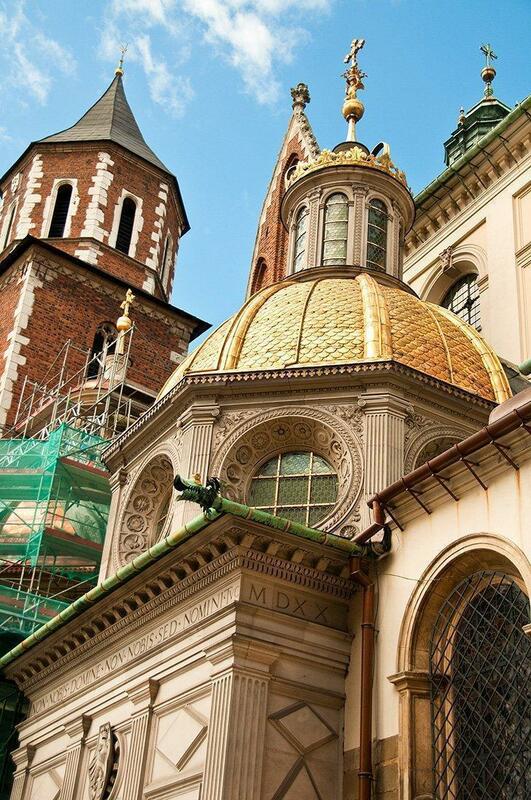 It is best to visit the Dragon’s Den at the end of your tour, as the cave’s exit is outside the Wawel complex. 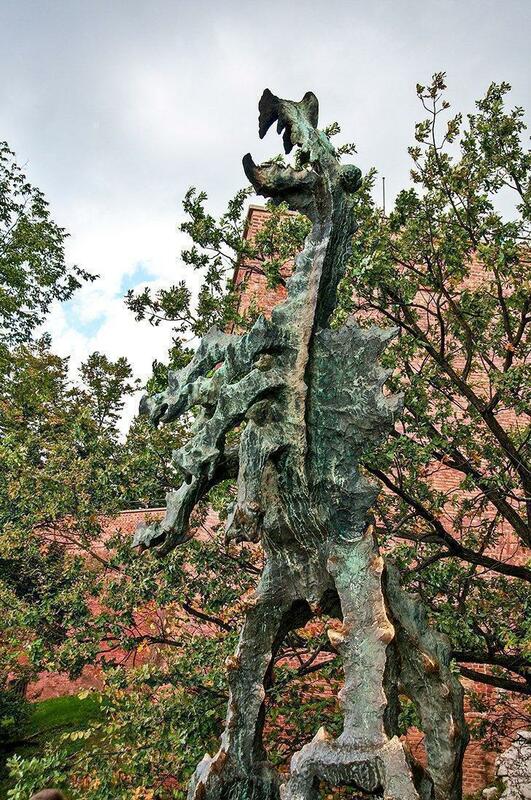 There you will see the Wawel Dragon or at least his statue. Sightseeing in Krakow? Don’t miss the dragon! We were only in Krakow for two nights and knew we’d be headed out to the countryside for our Polish-Belgian wedding, so we decided to spend all our time sightseeing in Krakow itself. If you’re in the city longer or wish to venture further afield, there are loads of great half and full day trips you can take. Where to Eat in Krakow or Eat. All. The. Pierogi! 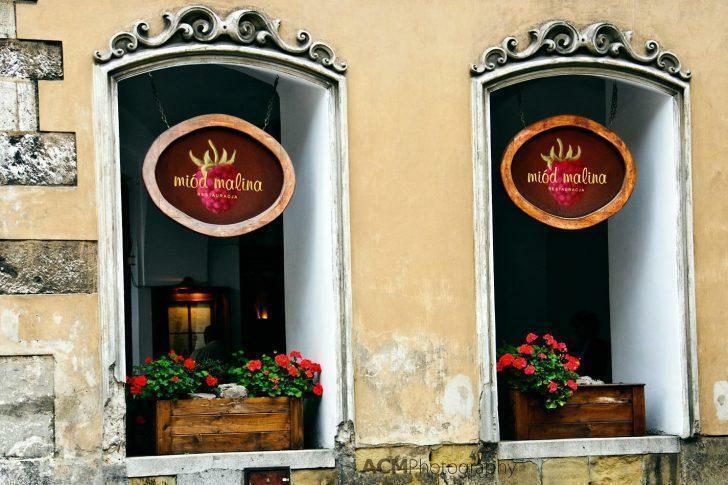 Miod Malina Restaurant is a great restaurant in Krakow’s historic city centre. On the recommendation of our friend, the Unexpected Traveller, we headed to Miod Malina and were not disappointed. 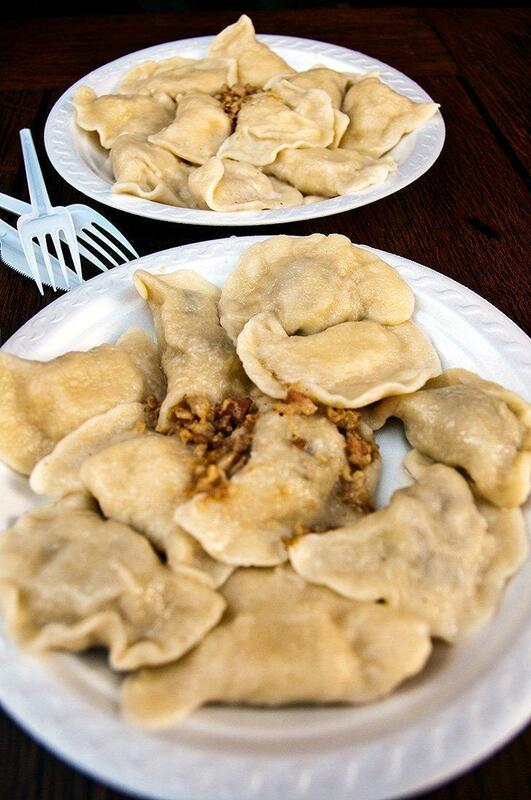 We began with what would be a marathon of pierogi sampling over the long weekend. Those at Miod Malina are still high on my favourites list. From there, Andrew moved on to pork knuckle (one of his all-time favourites), and I had a delicious duck leg in cranberry sauce. Zapiecek Polish Pierogi is Pierogi Heaven! We decided to extend our exploration into the world of the pierogi and stopped at Zapiecek Polish Pierogi. Andrew sampled from the mixed platter while I enjoyed the ‘Russian Style’ which, I am informed by the Polish bride, have nothing to do with Russia at all. The place was packed, and the perogies were cheap and filling. 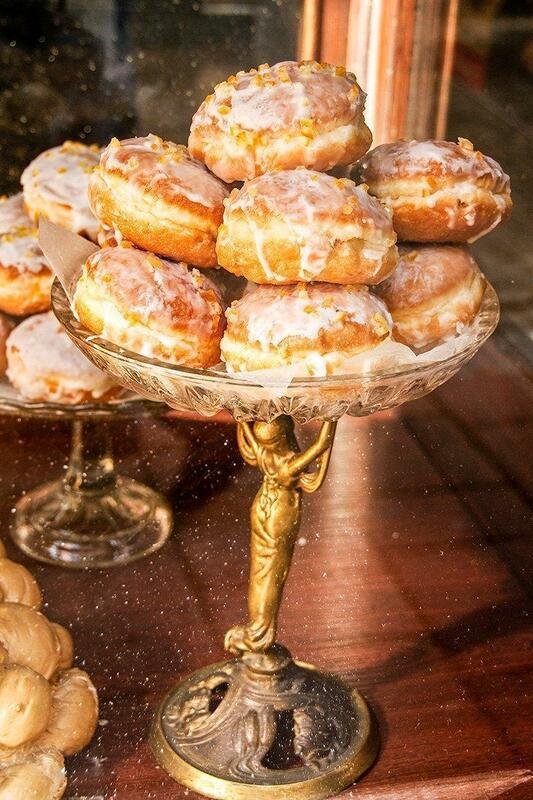 Don’t miss the delicious doughnuts available all over Krakow! On our final evening, we wanted to relax over a long, delicious evening meal, so we asked our hosts at the Globetroter for a recommendation. They suggested the Restaurant Nostalgia, located just outside the old centre. Sadly, it has since closed but it was a fabulous choice. The only problem was, after our starters (pierogies and stuffed mushrooms) we were already full! The main courses were too delicious to pass up, though – steak with a heavenly blue cheese sauce and potato dumplings for me and honey roasted spareribs for Andrew. The was no room for dessert, but we did enjoy some lovely wine with our meal. What a fantastic way to finish off a weekend break in Krakow. Read about our trip to the incredible Wieliczka Salt Mine, which was unlike anything I could have imagined and read all about what happens at a Polish (and Belgian) wedding in the mountains.